Miss Harper Lee, the Golden Girl who has wonderful adventures in Louisiana! I promise I do have pictures of Vance Orion selecting the winner, but apparently the USB cable for my camera has bitten the dust. Please let me know your preference for a Target or Amazon gift card and where to send it. I’m so excited for you, coming right on the heels of your birthday! Congratulations! I know you’ve just been holding your breath to learn the answers to the questions in Let’s Get Quizzical, so here they are! 5. Alexander the Great had a favorite dog who went to war with him, what was his name? Ducky discussed this at length on an episode of NCIS. 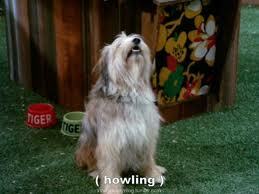 Peritas, breed unknown; although, Ducky refers to him as a mastiff in the NCIS episode Terminal Leave. 7. What was the name of the horse belonging to early western movie star Tom Mix? Bonus points if you can name the county and state where Tom Mix was born. Tony was the horse, and Tom Mix was born in Cameron County, PA where my parents and many dear friends are from. 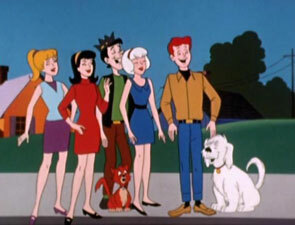 Archie Gang with Sabrina, Hot Dog and Salem. Hmm did we ever see Reggie & Sabrina together? This entry was posted in Uncategorized and tagged animals, canine, dogs, Dudley. Bookmark the permalink. 1 Response to And the Winner is . . .
I’m so excited, and I have some very special plans for the gift card! I think you’ll be pleased. Thank you very much!